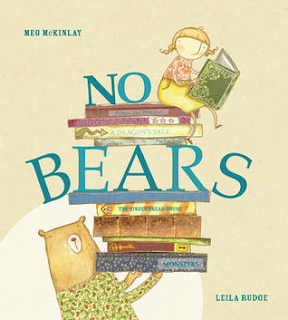 Since I’m inescapably drawn to writing picture books when I'm not working on my middle grade novels, I decided I’d better start reading more of them and figuring out what makes them work. 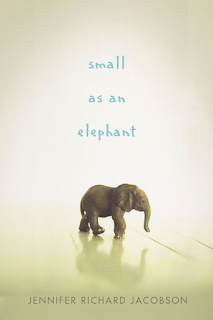 So every other Friday, I'm posting "Learning from Picture Books" to share what I've learned. The concept catches my attention – it’s simple and well-defined. The book appeared to have a lot of text, but it’s actually under 500 words. It has a story within a story, which is interesting, but I think it’s a difficult one to learn from in terms of structuring a picture book. The key learning for me was that a strong concept gives you room to build an interesting story. I love the way this book models writing and using your imagination, as well as the key words that signal you’re reading a fairy tale. It paves the way for a discussion and possibly some list-making about what kids would like to write about themselves. It also gives an opportunity for talking about how the pictures tell part of the story. Some children might be confused by the ending if they aren’t careful to pay attention to the pictures. Ever since Jack can remember, his mom has been unpredictable, sometimes loving and fun, other times caught in a whirlwind of energy and "spinning" wildly until it’s over. But Jack never thought his mom would take off during the night and leave him at a campground in Acadia National Park, with no way to reach her and barely enough money for food. Any other kid would report his mom gone, but Jack knows by now that he needs to figure things out for himself - starting with how to get from the backwoods of Maine to his home in Boston before DSS catches on. With nothing but a small toy elephant to keep him company, Jack begins the long journey south, a journey that will test his wits and his loyalties - and his trust that he may be part of a larger herd after all. The premise of this story caught my attention and I was intrigued. I read through this story quickly because I wanted to find out why Jack was alone and whether he’d find his mom. It was an interesting twist on a survival story, since Jack wasn’t totally out in the wilderness. Jack’s character and reactions were believable, although at times he seemed a little young for his age. As a writer, I loved the way the author used details to show Jack’s anxiety and tension, as well as to create a sense of his surroundings. Jennifer Richard Jacobson is a writer, teacher and educational consultant. She Boston and in New York. She loves to travel and used to be a competitive swimmer. She knew she wanted to be a writer when she was in fourth grade. For more info, visit Jennifer Jacobson’s website. The idea behind this quote is brilliant. Even if you start out writing junk, your brain is working and is going to kick in and start producing something useful (and then you can go back and delete the gibberish). So to get past a place where you’re stuck, you just start writing anything, even something unrelated to what you want to work on. Author’s Think Tank describes themselves as: A think tank of authors helping each other reach their potential. 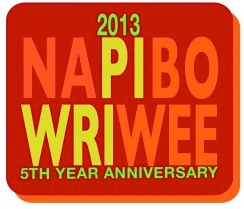 Their site has a blog with writing tips and information, as well as a series of podcasts. I only discovered this site recently and have been enjoying catching up on their podcasts. 2) Here's a podcast about revision that has given me a lot to think about, especially in terms of my goals for my story and characters. Cheryl Klein, Revision Techniques I by Cheryl Klein and James Monohan, The Narrative Breakdown. Cheryl and James discuss some of Cheryl's strategies for helping writers revise, including writing "intention" letter about the story, making a book map and using character charts. I've heard about some of these techniques before and they are also in Cheryl's book, Second Sight, but it was great to think about how they apply to what I'm currently writing. This is a podcast episode I'd probably listen to again from time to time. When Elise and Franklin start middle school, things feel all wrong. Bullying. Not fitting in. Franklin suddenly seems babyish. 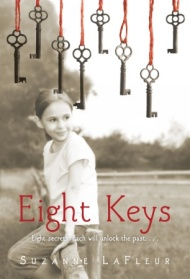 Then, soon after her 12th birthday, Elise receives a mysterious key left for her by her father. A key that unlocks one of the eight doors upstairs in the barn . . This was a touching story about that challenging time when you start middle school and your friendships and family life is changing. The characters in this story felt very alive to me, including Elise’s aunt and uncle (instead of being absent or fading into the background as in many middle grade novels). Elise wasn’t always kind to her best friend, but the story seemed a realistic portrayal of how Elise tried to find her place in the social sphere, and the problem of bullying and whether to talk about it to anyone or not. The mystery of the keys to the locked rooms in the barn was unique story element that kept me wanting to read more. As a writer, I’d study this book more closely to see how author created a full picture of the main character’s life, showing both her time at home and her time at school. There were careful details about the setting that created a strong sense of place. I really admired how the way Suzanne LaFleur layered in deeper emotions and thoughts. Suzanne LaFleur lives near Boston and in New York. She loves to travel and used to be a competitive swimmer. She knew she wanted to be a writer when she was in fourth grade. For more info, visit Suzanne LaFleur’s website. Another book I really enjoyed! The character of Jameson is what drew me into the story and kept me hooked. Reading this book was almost like hanging out with a really good friend. 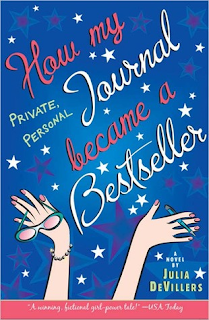 I could relate to Jamie’s ups and downs and dream of becoming a “famous writer”. And I could relate to all the times she did or said something embarrassing. This was a fun read. From a writing perspective, I’d definitely read this again to study how the author created the voice of the character. Julia DeVillers has an identical twin sister, Jennifer Roy, who is also a writer. They collaborate together on a book series featuring identical twins. How My Private, Personal Journal Became a Bestseller was made into a Disney Channel Original movie in 2006, called Read It and Weep. This book was inspired by a list Julia DeVillers made in high school. It included things she wanted to do when she was older, like "be published", "have a really cute boyfriend", and “help the world”. "...we hide our emotions all the time. And this means our characters should, too." This is so tricky to capture in a story. In the past, I've left it at that and assumed the reader would somehow interpret what I was trying to do. But the more I learn, the more I realize how important it is to make it obvious to the reader what emotion the character is feeling and trying to hide. This underlines again why it's so important to let the reader in on the character's thoughts and feelings (what literary agent Mary Kole describes as interiority). Of course, this is tricky too, because it has to be done a subtle, polished way to avoid the blatant "She felt..." or "He thought..."
She knows, too, that she is the only one that can save him. To rescue Patrick, Liza must go Below, armed with little more than her wits and a broom. There, she uncovers a vast world populated with talking rats, music-loving moles, greedy troglods, and overexcitable nids . . . as well as terrible dangers. But she will face her greatest challenge at the spindlers’ nests, where she encounters the evil queen and must pass a series of deadly tests — or else her soul, too, will remain Below forever. From author Lauren Oliver comes a bewitching story about the reaches of loyalty, the meaning of love, and the enduring power of hope. I thought The Spindlers was creepy – a book I know would’ve both scared and hooked my daughter when she was younger. It reminded me a lot of Alice’s Adventures in Wonderland, since Liza went underground and met a number of fantastical creatures on her way to rescue her brother (including a three-headed dog, which reminded me of the Harry Potter books). I liked Liza’s strong devotion to her brother, and the idea that she could tell something about him wasn’t right, when the adults couldn’t. From a writer’s perspective, I’d study the way the author carefully chose words and phrases to create powerful and vivid images. The writing style was definitely stood out for me. Lauren Oliver lives in Brooklyn, NY and grew up in a house “full of art and towers and towers of books.” As a child, her parents, who were both literature professors, encouraged her to draw, paint, dance and write stories. 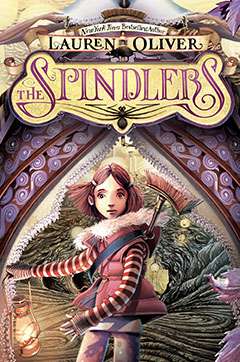 The book’s website has a video about the story behind The Spindlers. For more, visit The Spindler’s website or Lauren Oliver’s website. Or, if only I had a story to show my students about ___________. The interesting thing I've found about starting to write picture books again is that it has increased my productivity with my middle grade novel. You'd think it'd be the opposite, since I spend less time working on the novel. But I find that writing picture books is great when I need a break from my novel or when I get stuck. It often gets my creative brain in gear again. I can conceptualize an entire picture book in short space of time, something that's a bit more difficult with a middle grade novel and all the different pieces to weave together. And it helps to bring some fun back into writing when the novel is dragging me down a little. Writing Week. 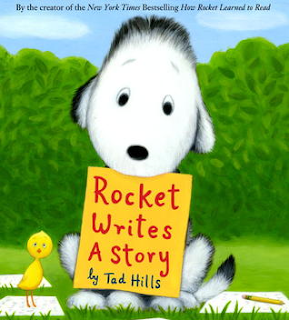 It's a challenge where you write a picture book a day each day from May 1 - 7. I figure if I complete four I'm doing well, but I have a secret hope that I'll get a chance to catch up on the weekend. Last week, two teen sisters, Julia and Emma Mogus, came to my school to tell us about an amazing project they started to bring books to aboriginal youth in the 49 communities of the Nishnawabe Aski Nation in Northern Ontario. In 2012, these girls collected and organized a way to send over 10, 000 books to these fly-in communties. They are also sending supplies like warm clothing, baby items, crafts and teacher resources. Never underestimate teens! I was so inspired, hearing about their goals and dreams and what they have accomplished at the ages of 13 and 14. It makes me want to work even harder to achieve my own goals and to write better books. If you want to know more about Julia and Emma and their accomplishments, visit them at the Books with No Bounds website or Books with No Bounds on Facebook. You can also read more about them in this article about Books With No Bounds from The National Post.